JULY 21 – On July 20, the United States and South Korea announced they would hold provocative military maneuvers next week in the Sea of Japan, to the east of North Korea. The exercises will include ten American warships, led by the USS George Washington, one of the largest nuclear aircraft carriers in the world. This will be followed up by maneuvers in the Yellow Sea, to the west of the Korean peninsula and close to China. On July 21, U.S. Secretary of State Hillary Clinton and War Secretary Robert Gates in Seoul, South Korea announced new sanctions against the North Korea and traveled to the Demilitarized Zone on the armistice line in the Korean War for some nuclear saber-rattling against the North. 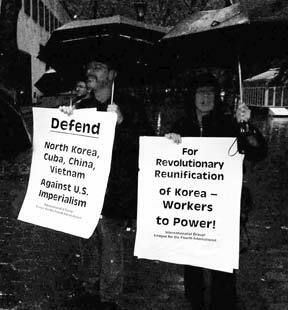 These “war games” and sanctions are a blatant attempt by U.S. imperialism to blackmail the isolated Democratic Peoples Republic of Korea (DPRK), and also pose a threat to the People’s Republic of China. North Korea and China are bureaucratically deformed workers states, which the Internationalist Group and League for the Fourth International defend against imperialism at the same time as we call for proletarian political revolution to oust the bureaucrats who endanger the remaining revolutionary gains.1 We defend North Korea’s right to have nuclear weapons as a deterrent to the aggressive U.S. and Japanese imperialists, who have never abandoned their drive to “roll back Communism” to the Yalu River (North Korea’s border with China) and beyond. The current wave of North Korea-bashing was triggered by the sinking of the South Korean corvette on March 26 and the deaths of 46 sailors on board. South Korean military and intelligence officials almost immediately pointed the finger of blame at the North. In late May, the Lee government formally accused the DPRK of launching a torpedo attack against the Cheonan, claiming this was the finding of an “international investigation” of the sinking. It then cut off all trade with the North and declared it would classify the DPRK as South Korea’s “main enemy.” The North Korean regime of Kim Jong Il countered by cutting off all ties with the South. North Korea categorically denies sinking the Cheonan, and has requested that North Korean military specialists be allowed to join the investigation. What actually happened in the March 26 incident is unclear. The main “proof” is a fragment of a propeller bearing the inscription “№ 1,” matching a North Korean torpedo found in the Yellow Sea some years ago. However, this supposed evidence was not found in the intensive naval search of the sea floor in the area, but showed up almost two months later in a fisherman’s net. The area where the ship went down is only 10 miles from North Korea, next to a South Korean island which is the site of a U.S.-South Korean base for anti-submarine warfare (ASW). It is almost inconceivable that a North Korean mini-sub could have approached the area quietly enough to avoid detection, particularly since the incident occurred shortly after a joint U.S.-South Korean ASW exercise. The Democrats in Washington have likewise been pushing a hard line against North Korea. An article in the New York Times (30 May) on “Five Possible Ways to War” in the Koreas, quotes a “senior administration official” saying, “We’re out of the inducements game... That’s over.” Nor is this something new. During the U.S. presidential election campaign, Obama argued that the Bush regime was pushing a “dumb war” in Iraq instead of the “real war” in Afghanistan, while ignoring other “threats” like Iran and North Korea. In an article in Foreign Affairs (July-August 2007), candidate Obama wrote that “we must develop a strong international coalition to prevent Iran from acquiring nuclear weapons and eliminate North Korea’s nuclear weapons program.... In confronting these threats, I will not take the military option off the table,” but the first response should be “aggressive diplomacy -- the kind that the Bush administration has been unable and unwilling to use. 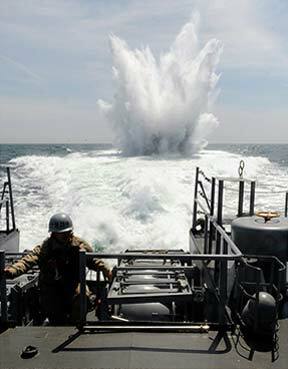 Could South Korean and the U.S. be responsible for the sinking of the Cheonan? Certainly they would not shrink from sacrificing the lives of South Korean sailors. In the 1980s, U.S. intelligence agencies working together with the KCIA sent a South Korean civilian airliner (KAL flight 007) on a spy mission over Soviet military installations on Sakhalin Island, and then screamed bloody murder when the Soviets shot down the intruder. In the 1950-53 Korean War, in which it slaughtered millions of Koreans, the U.S. Army was guilty of numerous massacres of refugees fleeing the fighting. A South Korean “truth commission” investigating wartime atrocities counted 138 U.S. massacres (for which it is being shut down by the Lee regime) while the ROK military and police executed as many as 200,000 “suspected leftists.” Trotskyists defended North Korea in the war. 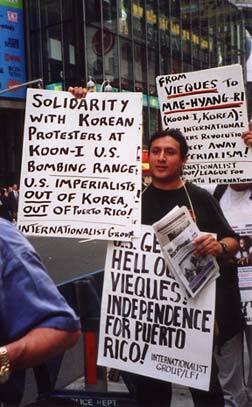 1 For a Trotskyist analysis of North Korea, see articles in The Internationalist No. 15, January-February 2003.